“Upstairs,” I said, “waiting for the beer tasting.” Blazer nodded. Samantha sat at the bar and kept mouthing to me: “Are you bored ?” Bored? In truth, I was having the time of my life. Four days earlier, more than 100 of us were getting ready to board the American Empress as strangers. We were set to follow the very route taken by the Lewis and Clark Expedition: from Clarkston, Washington, down the Snake River, and along the Columbia to its mouth at Cape Disappointment on the Pacific. Our trip, however, began with an hours-long bus ride from Spokane to Clarkston, where we were treated to a video introducing us to Diana, our excursion guide, and our cruise directors, Greg and Lindy, who would also serve as our nightly entertainment. We passed for miles through shorn wheat fields until, finally, the Empress stood before us: a filigreed two-stack riverboat. It was pure Mark Twain. “I’m Samantha!” yelled our neighbor across the hall after we’d set ourselves up in our well-appointed cabin. She was a pretty woman in her 50s, short blond hairdo, lots of jewelry. “I’m neurotic at the beginning, so I sent Vladimir down to the bar. Go keep him company.” Down below, her Russian husband was nursing a beer in the lounge, and we met Frank, the piano player. Lindy and Greg were there, a grinning married couple who looked as if they had been cheerful all their lives—or at least for the past few months, as the Empress had been running nonstop since March (and would keep chugging along well into November). Tonight, they weren’t performing, they told us. Dinner was upstairs at The River Grill & Bar—filet mignon and lobster tail—and then it was Banjomania, followed by Frank playing Rat Pack songs. “You know Liza Minnelli sometimes came in with the boys and sang,” he told us as he vamped. “So I’ll do one of hers, and anyone who knows the lyrics to the middle part, just come on up here and sing them.” I felt a tension growing inside me as he launched into “Cabaret.” Surely I’m not the only one who knows this part. Surely this crowd has seen Cabaret a hundred times. Surely it’s not going to be me. But as the song played on, I couldn’t stop myself from running onstage. You see, I have left something out. While the vast majority of passengers on our cruise were in their 70s and 80s, my husband, David, and I were a gay couple from San Francisco in our 40s on a romantic getaway. “Good morning, and welcome to Fox News! The time is 5:40 a.m.” The early dose of television came from directly behind my head through the cabin wall. It would turn out that our 90-something neighbor was hard of hearing. But it got us up for breakfast and out in time for our first premium shore excursion: Hells Canyon. This was one of perhaps a half-dozen side trips offered by Diana, a frosted blonde with blue eyeliner and the tense smile of a wedding planner. We were on a steel boat with clear plastic sides for a roughly four-hour trip down the Snake River to Hells Canyon and back, which left loads of time for Samantha to chat with us about relationships and for us to meet Blazer and Daisy. Captain Justin told us that at the mouth of the Columbia, many a ship had hit the sandbar and gone down, and Blazer turned to me and said he’d hit many a bar but never in a boat. Basalt formations rose above us in bleak splendor. Every fisherman on every boat waved at us, and Daisy and David waved back at every single one. We were back just in time for dinner. Our portage on the Snake River stood across from Lewis and Clark’s own campsite from October 1805. While their diet was, as William Clark put it in his fascinatingly poor spelling, “extremely bad haveing nothing but roots and dried fish,” we ate extraordinarily well on board the Empress. Blazer suggested we have both the steak and the lobster tail. We had it four nights in a row. And so did everybody else, I believe. On a cloud of local wines, we floated to the Show Lounge where a small crowd had turned out for Greg and Lindy’s “You Oughta Be in Pictures,” a tribute to the silver screen. Lindy, in a white dress that drifted up when she spun, sang “The Way We Were” in a Gilbert and Sullivan soprano, and Greg sang “New York State of Mind,” which was lovely, though no one could recall it being from a movie. Lindy, our hostess, hovered prettily until it was clear we were the only ones left in the bar. I thought I saw tears in her eyes from 14 hours of smiling. I wondered if she went below deck each night to drink from a flask and swear like a sailor. We bade her goodnight and slept as we passed from the Snake onto the Columbia River. A riverboat cruise seems not exactly tailored for a gay clientele. But if you think about it—the nostalgia for old-time glamour, the tinkle of bottles on the bar, the jazzy happy hour, the gowns and dress clothes, the bawdy late-night piano—what might draw someone in their 70s might also appeal to me. I assumed we would be outsiders among the other passengers; instead, we were fellow travelers. David talked cars with the old men while I talked books with their wives. When the retired dentist Ron sat down late one night to play the piano and asked who knew the words to “Stranger in Paradise” from Kismet, who got up there and sang in the spotlight? When, after a few martinis, a woman requested “Anything Goes,” whose name was called out by the crowd and who begrudgingly stood up and quietly started “In olden days, a glimpse of stocking …”? And the words to “My Way”? And “Goodbye Yellow Brick Road”? Yes, it was me. There is a pattern to life, if you look for it. For us, it began each morning with the TV and ended each evening at 10 when we were the only ones left in the lounge. In between, a quiet predictability began to flow as gently as the dammed Columbia: breakfast buffets, “Good morning, this is your cruise director Greg,” Lewis and Clark lectures, bingo or craft corner, happy hours with Frank, steaks and lobster tails, the shows, Frank again with me rising to sing the missing lyrics, and so on. “Are you bored ?” Samantha worried daily. Lindy’s costumes changed, the music varied like a Spotify playlist on shuffle, and Frank’s ties got wider and tackier, but we had found our daily rhythm, rising and sleeping with the tide of our elders. Beside us, golden grass and basalt gave way to the sage scrub desert. “The splendor of the West!” my husband would exclaim as we churned by. Along the way, we passed through eight locks—sometimes in daylight when everyone gathered on deck to look in wonder as the great gates opened, and sometimes while we slept. The most memorable was during the one-woman show “Lindy: On a High Note!” when she belted a Julie Andrews medley over the sound of grinding gears as the boat dropped 113 feet. On we passed, from high desert to the lush green of the Columbia River Gorge, and from there on to the Pacific. “The splendor of the West!” David kept saying. “Good morning, this is your cruise director,” Greg kept announcing. “Are you bored ?” Samantha kept asking. On it went, in this way, for eight days. Eight days with our spouses, on a riverboat. We were waiting for someone to snap. We were afraid it would be us. Steamboats have plied the Columbia since the 1830s, bringing fur and goods downriver to the Pacific, but the strong current and unnavigable falls made it challenging. Oregon Trail pioneers landing near The Dalles were forced to choose: Either make their way over the southern flank of Mt. Hood (facing possible starvation) or remove the wheels from their wagons, lash all their belongings to a log raft, and brave the wild river. Many tales of death and sorrow followed. Even Lewis and Clark, whose journey was a turning point in the American imagination, found the Columbia a disappointment: Instead of Thomas Jefferson’s dream of a navigable water route west, it was an angry river. Nonetheless, the government wasndetermined to tame the Columbia, and by 1873 the U.S. Army Corps of Engineers had removed the treacherous rocks below the mouth of John Day River. In 1893, work began on a lock to bypass the Columbia’s Cascades (now drowned beneath the Bonneville Lock and Dam). Today there are 14 dams on the Columbia. It is less a charging river and more a series of placid finger lakes. The salmon used to run so thick that old-timers claimed you could walk across the water on the backs of them. Some wonder whether the extraordinary engineering efforts to save the species’ population will ever make a difference. That wild Western river—the river of tribes who lived and fished along it for centuries, the river Meriwether Lewis wrote of as “swelling and boiling in a most tremendous manner”—is gone forever. But it is navigable. During our eight-day journey down the Snake and Columbia, the American Empress suffered not a ripple. It is one of the great pleasures of cruising to awaken, open the curtains, and see gold or green shoreline passing by, the water catching the morning light, the tribal fishing platforms and gillnets set out for the day, the cliffs and basalt castles of the gorge. 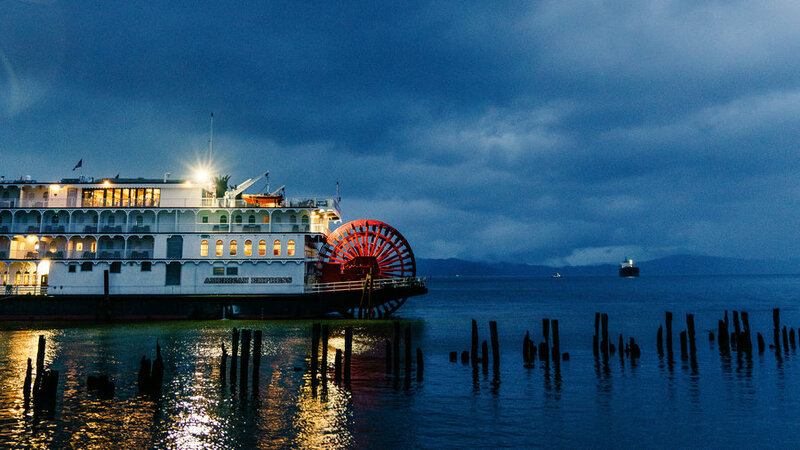 And, at night, to sit with a glass of wine and listen to the lap of water and the churn of the paddle wheel and hear Lindy sweetly crooning “Moon River” in the lounge. The Columbia has been tamed for this: for romance. People referred to David as my “friend,” or my “partner.” I was apparently David’s “buddy,” and yet it was quite clear they knew exactly what was going on. I would even say it delighted them. Our neighbor Janice—whose husband’s TV awakened us each morning—always greeted us with a twinkle in her eye, and during craft corner, she drew David aside to show him how to color the gift cards: “Just pretend you are water.” “Andy!” two couples from Virginia would call to me, and I would join them for a cocktail. One waiter asked us how long we had been together, and when David said nearly 20 years, he started to cry; he told us his cousin had run a gay bar near Santa Barbara and had been killed in a hate crime just a few years ago. It touched him to see a couple leading a happy life for so long. In the end, nobody snapped. One could, of course, sit in the boat’s River Grill and overhear mild irritations: Honey, your voice is too loud. Nobody wants to hear about your workshop. Do you think you need another glass? That’s not how I remember it. But, like that old pothole a city has never paved over, couples rode over them and went on. During her solo act, Lindy asked the crowd if anyone was in love. A good number raised their hands. Then she asked if anyone was in love with the person beside them. A terrifying question, really. But the hands stayed up. And later, during the dance party, when the band played “Smoke Gets In Your Eyes,” partners smiled anew at the one they had known and loved a long, long time. Were we bored? Of course we were bored, Samantha! We were married! But surely many of the couples had come on this cruise—and gone hang gliding and ventured to the Arctic and ziplined through Costa Rica—to get past the boredom and share some wine with that constant maddening, beloved companion: their spouse. That last night, at our early-bird dinner, we joined a set of old friends from Modesto, California: Ron and Joyce, Sandy and Marty. The foursome were on this trip because it was the best Sandy could handle; she had survived a terminal cancer diagnosis the year before but was still weak. I placed myself next to Sandy’s good ear and asked about long marriages. I asked her whether the thrill came back every few years, and that was when Marty broke in. The morning of our departure, I awoke before David, before Greg, and before Fox News. I opened the shades and looked out on the Columbia from where we were docked, just north of Portland. The first time I came out West was on a trip from New York City to Missoula, Montana. I remember standing on a bridge over the Clark Fork River, looking out at the sunset over the Rockies, thinking: All my life, this has been going on, and nobody told me! I fell in love with the West and moved to Missoula. I also fell in love with a local boy, for whom the spectacular sunsets and pine forests and toothy mountains were the ordinary background of life. For 20 years, we had traveled up and down the Columbia River on road trips and visits. And here at last we had done it by boat. A last adventure? Or 30 more years of them?